Xiaomi will add three new smartphone plants in India, bringing their total to five when completed. Xiaomi, with the largest share of the Indian smartphone market, is looking to build an infrastructure in India that will allow it to source its components locally, although it would have to convince over 50 suppliers to join them on the sub-continent. Xiaomi started assembling smartphones in India in 2015 as part of a joint venture with Foxconn and built a second plant last year with Shenzhen based HiPad. These plants have the capacity for 95% of the smartphones that Xiaomi sells in India to be locally assembled, but the company is also building its own PCB manufacturing facility in Tamil Nadu that will provide all of the PCBs needed for its smartphones sold in India by 3Q 2018. 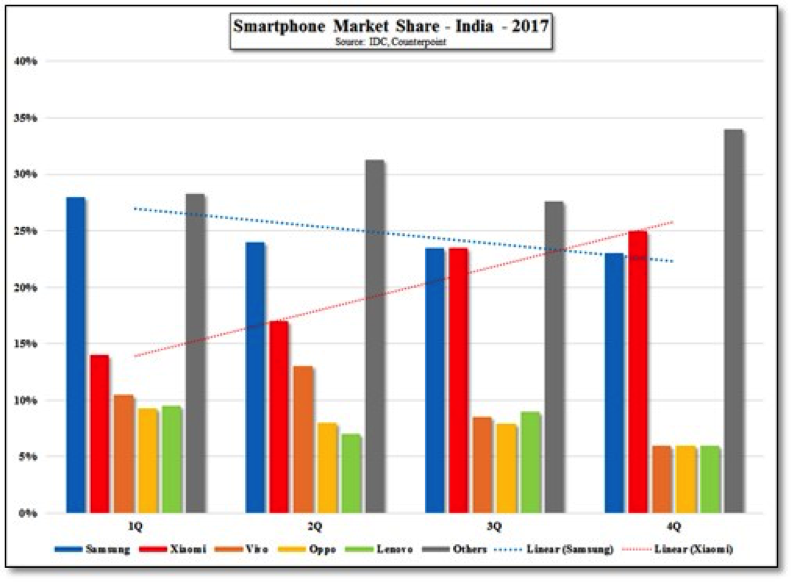 While the India smartphone market is still small in comparison to China (110m/q in China vs. 40m/q in India), the largest worldwide smartphone market, in 3Q 2017 India took the #2 smartphone market place from the US, selling 40m units, and while China saw it first year of negative smartphone growth and the US was flat, India grew 14% annually last year. Samsung Electronics lost its #1 position in India to Xiaomi, and while the race is still close, Xiaomi is making a significant effort to both garner favor with the India government and amp up its availability in India, while Chinese brands generally have displaced local Indian brands. While average price points are likely going to be lower than in China, Xiaomi has considerable experience in promoting mid-priced smartphones given their success on the mainland, and having local production will help to avoid the onerous import taxes the government has recently applied to PCBs for smartphones. Last week, we reported that Apple was working on curved screens and touchless gesture controls for the future iPhones. If these features find their way into final products, they would help Apple differentiate iPhones from rival devices in the crowded smartphone market. 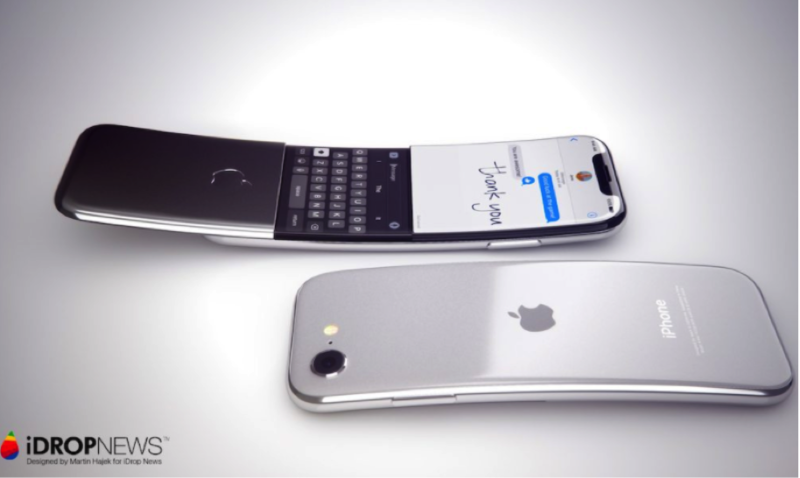 Based on Bloomberg’s scoop, noted graphic designer Martin Hajek and iDropNews have come up with a curved iPhone concept to show what the future iPhones could look like. Martin Hajek tried to bring the curved iPhone design to life via his renders. Hajek’s concept is similar to LG’s curved phones LG G Flex and LG G Flex 2. Surprisingly, the curved iPhone also has a Nokia 8110-like keyboard cover that occupies almost half the screen while offering little benefit. The Nokia 8110 aka the banana phone was featured in the first Matrix movie. 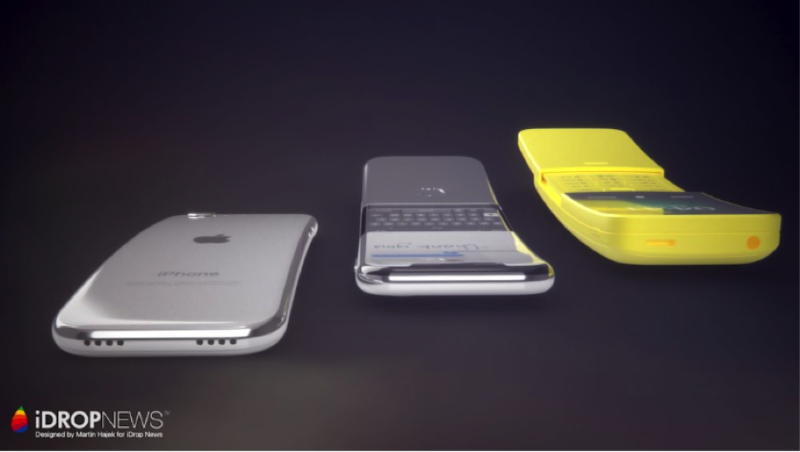 Hajek’s curved iPhone concept has an aluminum slide-down panel on the front that hides a touch keyboard. Even more interesting is that the phone has not one but two Apple logos. One is of course on the rear while the second logo is located on the slide-down plate. It isn’t clear how the slide-down panel and the overall design of the handset would benefit users. Why is Apple's giant iPhone X necessary now? The iPhone X comes in only one screen size (5.8-inches). A giant 6.5-inch iPhone X "Plus" (or whatever Apple decides to call it) would mean Apple, for the first time, will have a phone to compete head on with the likes of the 6.3-inch Galaxy Note 8 (and upcoming Note 9). Price: RBC Capital Markets analyst Amit Daryanani said in a research note in March that the next iPhone X will be priced at $899 and the upcoming iPhone X Plus at $999 -- the same as the current iPhone X. And the 6.1-inch mid-range iPhone (LCD) would slot in at $799.